Hello fellow Brothers & Sister, bikers across the nation ! This is the verry 1st Sasquatch report, reporting on the adventures of my club Sons of liberty riders - MC & RC . Because this September 1st. We embarked on a journey to visit our RC. Chapter near Madisonville Tennessee . We averaged 550 miles a day or 1100 miles in 2 days. We departed Grand Prairie, Tx @ K.S.U. 5:00am after Breakfast @ the waffle house where we all met @3:30 am. We arrived at the downtown Super 8 motel that evening in Memphis Tennessee . And I want to give two thumbs up to the Super 8 there 👍👍! Really friendly people And there hospitality was class A . Then on morning #2 (KSU)@7am, Ye Haw ! 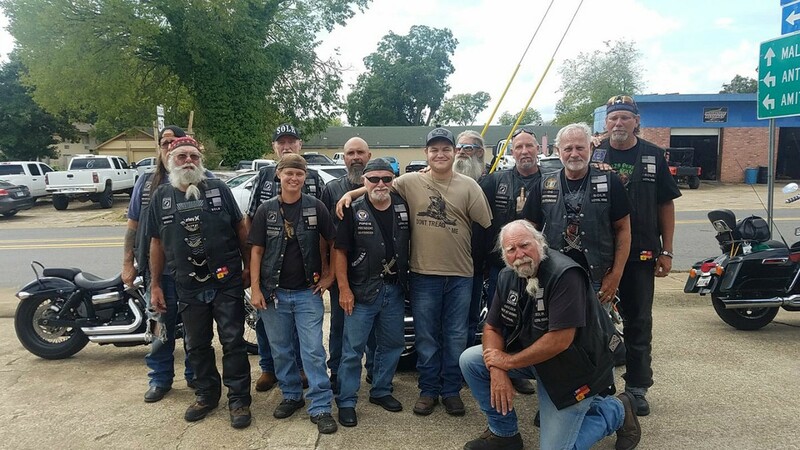 We road from Memphis to Meet up with our Tennessee Club Brothers in Mont Eagle Tn. Where we had a great reunion and re-association. My first year in the club our two chapters met in Memphis, TN. but this year we road on out to our Brothers Home town . It is Beautiful Country out here in the Appalachian Mountains . And plenty of curvy mountain roads to ride on and test you riding ability . We have been having a wonderful time here riding and partying together . We the Texas group are staying at Mountain view Cabins in Tellico planes TN. I have to say they are class A, they are the most beautiful cabins I have ever had the privilege to stay in . With hunting & fishing decor trough out, and a river just outside the back door . Each Cabin can accommodate more 10 people or more if you don't mind sleeping on a comfortable couch. Equipped with a washer & dryer, just like home ! Well, I am having such a good time its going to be hard to leave here when it's time to go ! Today most of the Brothers are going to ride the Dragons Tail ! A very challenging and curvy road with more curves than Stormy Daniels ! 318 + curves in a 11 mile stretch I was told . I'm keeping my fingers crossed that every one will make it through with out incident . Ride safe Brothers ! A special thanks to the Downtown super 8 in Memphis Tn. & The Mountain view Cabins in Tellico Tn. And a very special thanks to our hosts, the SONS OF LIBERTY RIDERS R.C. of TENNESSEE ! This has been the very 1st. Sasquatch report from Tellico Planes Tennessee ! I'll be back . And keep the rubber side down !